Technology that is significantly advanced is indistinguishable from magic. It's a common line in classic science fiction literature. If you didn't know what a flashlight was, or how a flashlight worked, imagine how magical it would appear. There are very few areas of consumer electronics that allow this concept to be driven home quite as effectively as in home audio. Having been raised on the concept that big speakers mean big sound, I've learned long ago that now days that isn't true. Big speakers still have big sound, but so do small ones, and tiny ones, and medium ones, and ones that look like Frisbees and tin cans. I remember an audio demonstration two or three years ago where we were seated before massive speakers and bombarded by beautiful, heart-shaking three-dimensional audio. When it was over, the PR fellow come out and pushed the big speakers out of the way to reveal these tiny things about half the size of your fist that had actually been playing the music, not the big ones. I felt like I was looking at a TV for the first time trying to puzzle out how they fit so many people into such a tiny box. If there is any area of consumer electronics where I'm prepared to suspend disbelief, audio is the most likely. The SoundAROUND, from Xitel, is advertised as a replacement for a traditional 5.1 surround sound system, but is only a box about the size of a paperback novel. It's designed to intercept the signal from the source, like your DVD player, and modify the signal before it reaches your amp and speakers to create an artificial surround sound out of only two speakers located in front of you. Chiefly, Xitel advertises that the SoundAROUND will do three things: 1.) Increase the bass from any system, any speakers, for a rich bass experience that does not need a subwoofer, 2.) 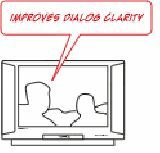 increase dialog clarity so you don't have to worry about voices being lost in the increased bass, and 3.) trick your brain into hearing sounds as if they're coming from all around you, giving you a 3D sound experience without the need to run speaker wire behind your couch. These are not minor claims. There are no half suggestions, things like, We can improve your sound,? or any of the like. The advertising is, Get cinema quality surround sound through two speakers!? Everything the SoundAROUND does is a matter of tricking your brain. Supposedly, it's able to achieve rich bass sounds without overdriving your speakers by mixing mid-range signals that your brain then mistakenly interprets as bass. Since the mid-range signals are easier for most speakers to produce, you can get a lot more bass out of your current set-up. It mixes the audio in weird ways to trick your brain into hearing sounds from behind you, even when no speakers are behind you to produce sound. If it works, how it does so is beyond me in detail; whatever explanation Xitel gives, in my opinion there's conjuring involved. Sadly, the SoundAROUND is an exceptional device that doesn't do what it claims to do to the extreme claimed in their advertising. The chief advertised feature, that the SoundAROUND - a unit designed for gamers - uses audio to trick your brain into hearing sound coming from behind you, is almost completely without support. In fact, after testing the unit on a dozen games - including Halo 2 and Resident Evil 4 - and on a half a dozen sound systems, two of which were bought solely for the purpose of giving the SoundAROUND a fair chance to represent itself, the 3D effect was so absent that for some time I was convinced I was doing something wrong. When I hooked up the Xitel unit, the sound got better. The bass increased, the vocals clarified, and nearly every system it was attached to, from the $20 dollar Goodwill speakers picked up for testing to the more expensive home theater setups, were better systems with it attached than they were by themselves. However, aside from a slight increase it the feeling of sound coming at you from between the two speakers, there was little increase in the feeling of surround sound from a two speaker system, certainly nothing that an uninformed casual observer would consider describing as comparable to a traditional 5.1 system. I trooped friends and family in and out of the room waiting for someone to leap up with a look of awe and shout, It's all around me!? but no one ever did. As a surround sound unit, the Xitel SoundAROUND is a failure, and oddly enough, I'd still probably buy one if I were putting together a new sound system. It does not do the biggest of its advertised claims, the 3D effect, but it does the other two exceptionally well, and can make almost any system sound better. If it weren't for the extent of the claims made in the advertising, which promise an experience that would have been nearly impossible to live up to - magic, in-other-words - the Xitel unit would have earned a much higher rating. As it is, the review looks at the unit in terms of what it promises to the consumer at purchase, and in this case SoundAROUND doesn't come close to the level of expectation built by the box, or by the massive amounts of advertising material on their website. Articles entitled, Why the SoundAROUND works so well compared to multi-speaker systems? would suggest that you can use the SoundAROUND as a fair replacement to a 5.1 system even if you could afford either, and it simply isn't. That said, I would buy and praise the Xitel SoundAROUND because of its amazing ability to improve audio. It does it well enough that you would show it off to your friends when they came over, pulling them to the side saying, Listen to this. Check out how much better this sounds now.? The SoundAROUND sells for roughly $100, and so when I began writing this review I approached it from a practical standpoint. Whatever the unit offered, it had to be able to make $20 dollar speakers capable of competing with a traditional $120 dollar sound system. If it didn't there would be no justification to buy it over more common audio solutions available at Walmart, short of not having to run wire. While it wasn't able to turn my 2 speaker setup into a rocking 3D home theater, it was able to take my basic 4-speaker, Goodwill purchased and built audio system, which cost me about $20 dollars in total, and had no subwoofer, and increase its sound quality to the point that it really was competitive with my $160 5.1 sound system upstairs. That unto itself was impressive, but then when attached to the more expensive unit, you found an equal increase in quality. The system was able to play much louder and much clearer without distortion than it would have been able to alone. In short, had Xitel decided to market the SoundAROUND as an audio enhancer, I'd endorse it almost immediately. Because they decided to advertise it to do something else, the score that it earned, a descent 3 stars, is almost deceiving. Three stars would suggest that it does somewhat well what it claims to do, which is not the case. The SoundAROUND is saved because it sounds good, but not because it's anything revolutionary. If there's magic, it's magic that's been around for a little while, and claims to help you find the love of your life when all it really does is hook you up for one date.